This is our Aduino Mega controlled 32x32 RGB Matrix Sign with each of the 6 panels driven by a Pro/Mini. It brings the Arduino brains to these gorgeous panels and allows you to control them via simple serial commands. It comes fully Assembled in a 3 x 2 (24" x 16") flat panel & Tested. It can operate by itself or connected to other panels or cubes. 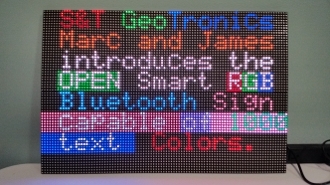 The sign is controllable via Bluetooth.